In the eighteenth century the idea of the landscape garden spread all over Europe. At the same time the garden became the land of illusion: Chinese pagodas, Egyptian tombs and Turkish mosques, along with Gothic stables and Greek and Roman temples, formed a miniature world in which distance mingled with the past. The keen interest in a fairy-tale Orient was manifested also in architecture. This "Orient", which could hardly be clearly defined geographically, was characterized by Islamic culture. The Islamic styles seemed especially appropriate for buildings of a secular and cheerful character. The promise of happiness associated with an Orient staged by architectural means was intended to guarantee the commercial success of coffee houses and music halls, amusement parks and steam baths. 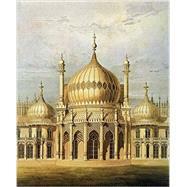 But even extravagant summer residences and middle-class villas were built in faux-Oriental styles. Stefan Koppelkamm lives in Berlin and teaches communication design at the Kunsthochschule Berlin-Weißensee.